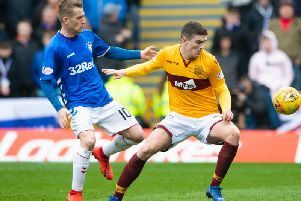 Referee Nick Walsh was forced to temporarily halt play during Gers’ 3-0 Fir Park win near the end of the first half when a cigarette lighter and a pie were aimed at the Gers skipper. Well chiefs say they have been able to identify one of the culprits after studying CCTV footage and have issued an indefinite ban. The Steelmen say they are continuing to investigate a second individual who they believe also threw an object onto the pitch and plan to issue another suspension order as soon as possible.